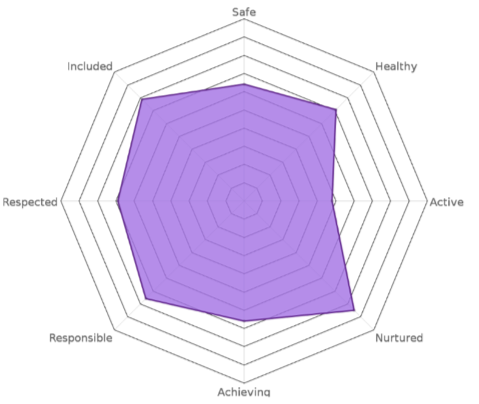 The assessments and reports generated by BeingMe show a clear picture of a young person’s strengths and weaknesses. This enables a more focused approach to building well-being. The assessment is designed to be appropriate and adaptive. The majority of pupils will answer the entry level questions, this will give a good broad understanding of their well-being. However, based on their answers Alex may ask additional questions. BeingMe gives schools the capability to assess resilience and well-being based on quantitative data validated in a 10-year study costing over CAD 1million. BeingMe removes adults from the assessment process by using digital technology that young people can relate to. This provides a more accurate and objective assessment than other assessment methods. The BeingMe assessment is based on Dr Michael Ungar’s (Dalhousie University, Halifax, Nova Scotia) work with children who have been marginalised and who has developed a broad research base for his work on Resilience. Educational Psychologists in Aberdeen worked with young people in focus groups to ensure that the questions were culturally valid. Psychologists at Liverpool Hope university tested the app across six secondary schools and 1200 young people in the UK. It was found that the test/retest reliability of the app was greater than that of a paper assessment. The overall scores when pupils used BeingMe also suggested they were more truthful than when completing a paper assessment. Our reports provide detailed insight into the changes that need to be made to improve a young person’s well-being. Once a young person has completed the assessment using BeingMe, several reports are generated, giving an overview of where the young person is struggling. 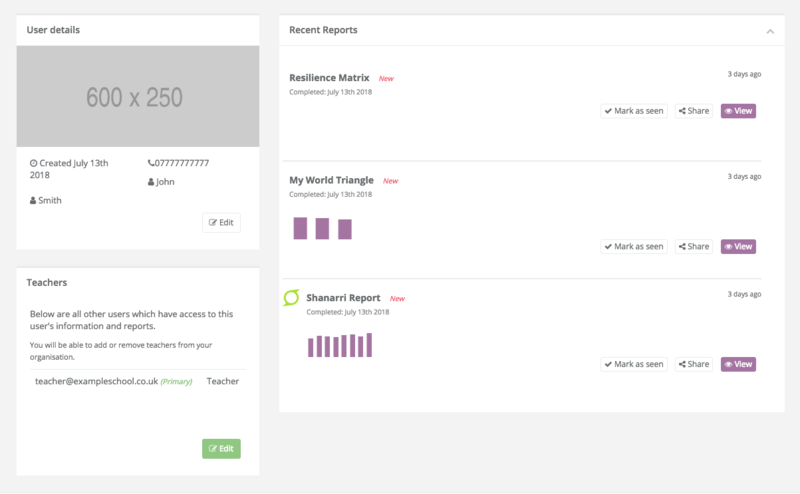 These reports can be viewed in BeingMe by the young person, or by teachers using our online portal. An expanded SHANARRI report and a resilience matrix are the two most important reports we provide. These detailed reports expand upon previous assessments used in schools. They highlight which specific areas students are struggling and give recommendations to help them improve their health and well-being. The simple 8 indicator SHANARRI report was previously criticised by the high court of Scotland as being too general. BeingMe looks at more than just the 8 SHANARRI indicators by breaking the young person’s scores into more specific categories. This allows a more accurate assessment than the simple SHANARRI assessment and enables teachers and carers to target support closer to the specific needs of the young person. This detailed insight into a young person’s current state of well-being allows schools to identify which young people may be struggling with mental health problems or need support in specific areas of their lives, identifying these problems early on results in less young people requiring medical intervention. BeingMe assists teachers in developing student’s well-being to it’s fullest potential and increase their ability to learn, by allowing regular assessments to track progress and giving the young person a voice, increasing their ability to learn. Working with Dr Julienne McGeough of Liverpool Hope University, APPA Scotland has developed the simple SHANARRI report into the SHANNARI40®, by identifying the following more meaningful sub-constructs within each of the 8 indicators. Having a nurturing place to live in a family setting, with additional help if needed, or, where possible, in a suitable care setting. Protected from abuse, neglect or harm at home, at school and in the community. Having opportunities to take part in activities such as play, recreation and sport, which contribute to healthy growth and development, at home, in school and in the community. Having help to overcome social, educational, physical and economic inequalities, and being accepted as part of the community in which they live and learn. Having the highest attainable standards of physical and mental health, access to suitable healthcare and support in learning to make healthy, safe choices. Having opportunities and encouragement to play active and responsible roles at home, in school and in the community, and where necessary, having appropriate guidance and supervision, and being involved in decisions that affect them. The most important report our assessment generates is an expanded SHANARRI report called the SHANARRI40®. This gives teachers detailed insight into all the different area of the young person’s life. 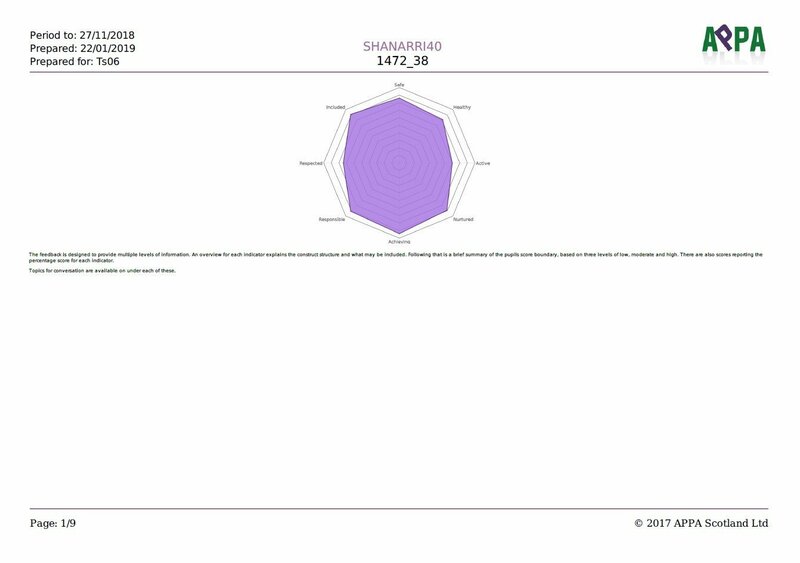 This sample report shows an example of a SHANNARI40® report, with an overview of their score and a breakdown of the subgroups. This simple and quick assessment looks at the personality of the young person in relation to the environmental risks that they encounter. The report creates a clear picture of how resilient the young person feels and how at risk they feel in their home and community environment. Interpretation of the graph to the left shows a young person who does not feel vulnerable and has a fair amount of resilience. They will be reasonably well supported at home and in their community. Showing that both where they live and their school is providing them with an environment where they can flourish. This report provides a quick overview of a young person’s well-being using two scales. This score represents how resilient the young person is. This means how well the young person is able to use the resources provided to them to overcome any challenges or difficulties in their lives. 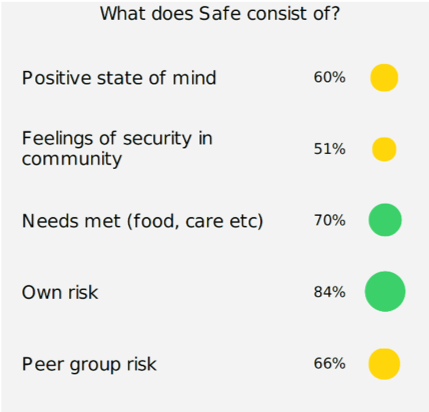 This score indicates safe the young person feels in their environment, as well as the challenges they face in their day-to-day lives. It can also show how many helpful resources the young person has access to. 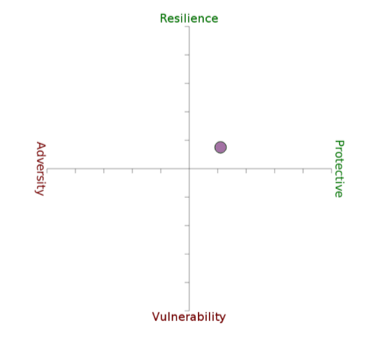 The assessment also generates a report called a Resilience Matrix. This report gives teachers a very quick snapshot of that young person’s life, the problems they face and the tools they are equipped with to overcome these problems. 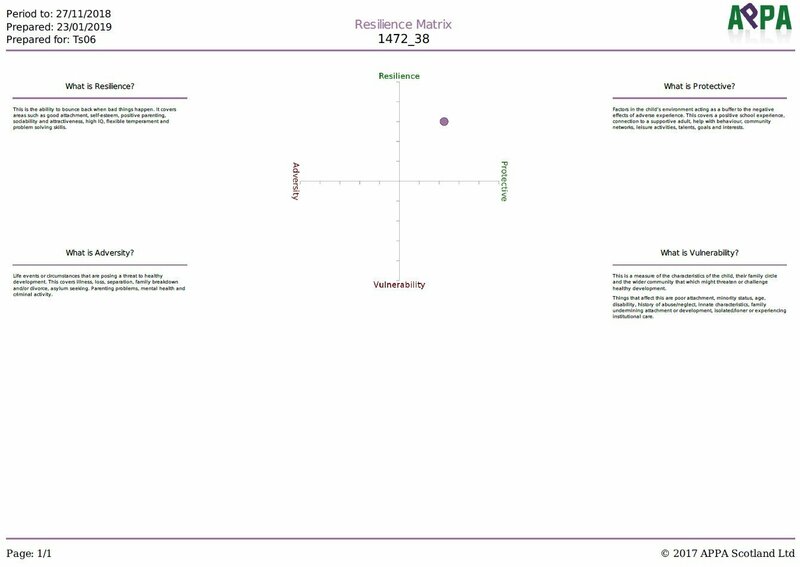 This sample report shows an example of a Resilience Matrix report, with a score and an explanation of its meaning.